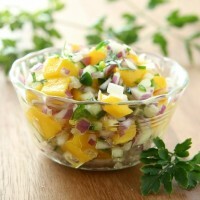 Mango salsa is a great condiment to bring to all summer BBQs and parties. The perfect combination of sweet flavor, from the mango, and spicy kick, from the mag, adds a twist from traditional salsa. This mango salsa is so versatile! Use it as a dip and enjoy with chopped yellow peppers and jicama, or eat it with tortilla chips. It also makes for a delicious salad dressing, a sauce for your favorite sandwich wrapped in collard greens or whole wheat wrap, or as a topping to your fish tacos that the whole family is sure to enjoy on taco Tuesday! Not only is this salsa delicious, it is full of ingredients that are great for our body! The sweet mango is an awesome source of beta-carotene (1), which is converted into vitamin A by your body that leads to glowing, soft skin. The red bell peppers are high in vitamin C (1), which contributes to firm, smooth skin by helping build collagen. Peel mango and chop it up. There are mango cutters you can buy to easily cut around the big seed. Add all chopped ingredients to a big bowl, squeeze lime juice on top and mix together. Add more lime if needed and sprinkle salt and cayenne pepper on top if you prefer. 1. USDA. What Foods Are Good Sources of Vitamin A, C, Calcium, and Iron?. Available at: https://www.fns.usda.gov/sites/default/files/appendb.pdf. Accessed July 22, 2015.